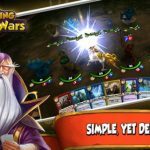 We’ve already given you a bit of a background on Card King: Dragon Wars, which is that insanely great and free card battle game for iOS devices. As a reminder, this is the game where “cards become creatures and creatures battle against powerful and magical enemies,” each of those foes having distinct skills, spells, and strategies. 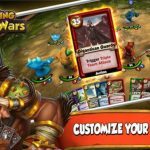 You can customize your deck to your liking, command all sorts of creatures, and also battle it out in multiplayer mode, facing up against other Card Kings and earning more loot and other prizes. That’s actually our way of leading to the meat of the topic, which is the game’s arena battles. 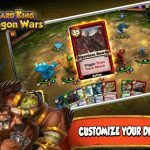 Follow these Card King: Dragon Wars tips and tricks and you’ll be ruling the roost at the Battle Arena and scoring more loot, even if you’re facing other human Card Kings. You may be wondering why we are asking you to focus on single player competition when this strategy guide is about Battle Arena mode. But there is logic behind this – if you’re in battle for long enough while in single player mode, your Hero will rank better, and you’ll be able to recruit more and better cards. Of course, it pays to the best possible lineup of cards when fighting in the Battle Arena. These cards are your rarest ones, your highest-performing cards, but you don’t necessarily have to have them at Level 25. The game’s mechanic sets the level to 25 when in Battle Arena, so if you’ve got some low-level cards in your deck at Level 1, they’ll be considered Level 25 as well. 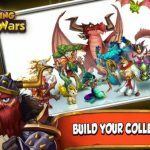 Be careful, because you just might get played in Card King: Dragon Wars. This means you may potentially make some rookie mistakes and end up losing a Battle Arena fight against someone whose win-loss record is nothing to write home about. Don’t limit yourself to the obvious, which is strategizing exclusively with your deck in mind. What you should do instead is scout your opponents, see what style they use, and learn from whatever mistakes you may have made. This could also help you learn some of the game’s more intricate mechanics, such as making the most out of your advantage and getting some attack strategies.